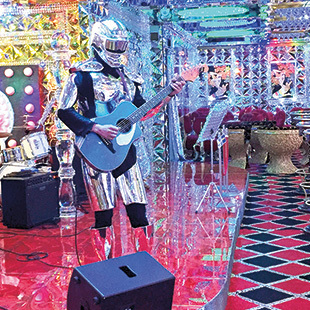 When Cyndi Lauper sang, “Lying in my bed, I hear the clock tick and think of you / Caught up in circles, confusion is nothing new,” I don’t think she knew about Shinjuku’s Robot Restaurant. But the description is apt, and the robots seem to agree. As we sat in the waiting room, preparing to descend a psychedelic staircase to the show floor, the strains of “Time After Time” drifted delicately through the air. Performing the 1984 hit on acoustic guitar was a shiny metal man—or woman—who may have been a Cylon. It wasn’t what we were expecting when we journeyed into the heart of Kabukicho, and it wouldn’t be the last circle of confusion we’d find ourselves in. But confusion is part of the fun of Robot Restaurant. 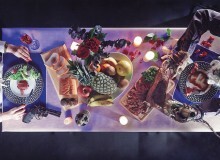 It’s a bafflement that stems from the swirling patterns and colors of the decor and the sheer chaos of the show itself. In fact, this seems to be the premise of the attraction, which opened in July 2012 and has since become one of Tokyo’s must-visit spots for tourists and residents alike. When most people who have not yet been inducted into the insanity hear the name Robot Restaurant, they naturally expect to find robots. And while there are some humanoids of the mechanical variety to be found inside these LED and mirror-laden walls, they seem to be in the minority. 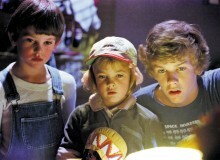 Skimpily-clad girls, mechanical dinosaurs, mermaids, and even a cow round out the most bizarre show you’re likely to see. Sounds like fun, right? Kumin Hancock thought so. Kumin, whose mother is Filipino and father Japanese, learned of Robot Restaurant from seeing the advertisement trucks with giant robots that have been known to cruise the city. When friends also told the dancer about the show, she knew she wanted to be part of it. And she is. During the days she performs—which come three times a week—Kumin has a very visible role. Dancing in the spotlight was, of course, the initial draw. But as Kumin explained, the battles and the taiko (the show involves extensive drumming on both Japanese drums and the snares you find in a marching band) add so much fun to the job. It’s variety that also generates energy, and the compact show floor channels that energy to connect performer and viewer. “Even though the stage is small, I enjoy performing with the other girls and feeling the excitement of the crowd,” Kumin says. It’s now been a year and a half since she joined Robot Restaurant; but as wonderful as it has been, it almost wasn’t. When auditioning, hopefuls get only one shot—and most don’t make the cut. The process involves dancing freestyle in front of the judges, who decide based on that single performance whether you’re in or out. That’s enough to make even a robot sweat. Made it she did, and she’s become one of the most popular dancers at Robot Restaurant. Maintaining that position takes a lot of work, and the group rehearses seven days a week. On the days when she isn’t performing, she sometimes watches the show from the audience. She notes that you can really feel the energy of the performance as the robots come up close to the crowd—something we can attest to firsthand. Seeing the spectacle from the other side of the curtain also allows her to make the experience better for the guests. Without a doubt, Robot Restaurant is an experience everyone should have at least once. 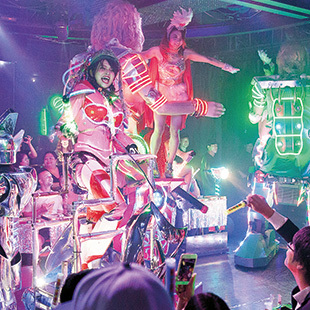 “Robot Restaurant is a strange atmosphere,” admits Kumin, “but please come!” And as the regulars can confirm, visitors will take home a suitcase of memories, time after time.